On "break" #2 sets pick for #3. #3 Scrapes off of the pick and rolls straight toward the ball. #2 then opens to the ball and rolls straight toward the baseline. #1 has two options--Hit # 3 or # 2. Whichever guard does not receives the pass goes to the right sideline (if facing our bucket). If inbounder gets into trouble #4 or #5 may break towards the ball to get it in. Once the pass is made #1 breaks toward the left sideline and the other guard (without the ball) breaks to the right sideline. The post break as well. Their rule is to break up if away from the inbound pass. Break back if inbound pass is on their side. Inbound receiver has three options now. Both sideline guards need to stay even or in front of the ball. No matter where the pass is, run your lanes to get open. Inbound pass receiver (here it is #3) stays back for ball reversal or safety. Try to pass the ball up court instead of dribbling. This is much faster. 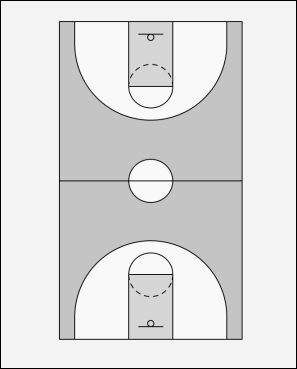 Once across half court line dribble to draw coverage and then dish to players breaking to bucket. Backside guard breaks to bucket on backside. Post on offensive end breaks to near post. Defensive side post stays just past half court as safety valve. 1) Pass to near block. 2) Pass to backside block. 3) Pass to safety and set up offense if no advantage.